As low as $6 for 3 Reusable Bags & Pac + Free Shipping! Head over to Groupalicious and you can get 3 reusable bags and carrying pac for as low as $6 plus free shipping! The deal is on sale for $11, but sign up using these links to get a $5 credit, making them just $6! 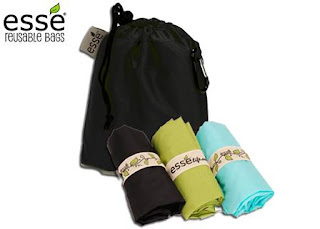 Esse Reusable Bags makes your shopping trips easy and more friendly for the planet. You get three everyday reusable bags in a color of your choice, which are made from recycled plastic bottles. Each is large enough to carry up to 20 pounds and has a long handle to fit over your shoulder. Roll them up to easily fit into your purse or pocket. Plus, you get one drawstring Pak with a carabiner clip to hang on your belt loop or purse.